A special training supplement illustrated with actual weather charts, tables, pictures and graphics to highlight the pilot-in-command's planning and decision-making process with respect to operating under IFR when in-flight airframe icing conditions must be considered. Intended to be used in conjunction with Austin's Very Easy Guide to Winter Operations. For the purposes of this example scenario, we shall consider an imaginary Part 135 carrier -- Austin's Air Service, LLC. (This is the same imaginary carrier I use throughout my AVEG series.) Suppose AAS Dispatch calls you up at home and offers you a "special" -- a one-time assignment not associated with a regular contract run. (AAS is an on-demand / unscheduled operator, so this sort of thing is not uncommon.) It would entail flying IFR from Orlando (ORL) to Gainesville (GNV) at 4,000 feet with a single 30-pound document pouch filled with proof-of-deposit (P.O.D.) work for one of our bank customers. The date is Saturday, January 9th, 2010. As you get to the airport, it's rainy, misty, cloudy and quite chilly. Will conditions be improving or deteriorating as you proceed northwestbound? Will conditions be improving or deteriorating at all locations from your point of departure to your point of intended arrival as the day progresses? Do you have reliable outs should you encounter ice? 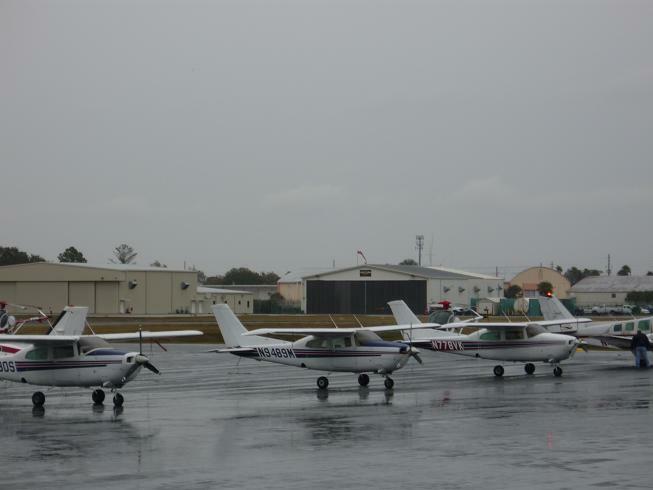 Are actual icing conditions expected or reported along your route and at your altitude? Do you need an ice-approved airplane to safely and legally make this flight? It's only two degrees (Celsius) above freezing at ground level. The dew point is minus six, giving a temperature-dew point spread of eight degrees. Assuming a standard approximate lapse rate of about 2 degrees per thousand feet, we would assume that the ceiling (defined, as you recall, as the lowest broken or overcast layer) would be found at about 4,000 feet, and guess what? Sure enough -- it is. We would also assume based on this same rule-of-thumb math that the freezing level is at about one thousand feet -- bearing in mind that there is often an inversion layer in cold weather, meaning that the real freezing layer may be higher than that. Since it's currently raining, if the freezing level really is 1,000 feet, it would be necessary to take an ice-approved airplane. Why is there often an inversion layer in cold weather, especially in the morning? Well, the answer is quite simple: the planet Earth radiates heat away into space overnight, becoming very cold, while the air above it (which does not radiate heat) remains at a relatively constant temperature. The part of the atmosphere immediately adjacent to the ground is cooled by its proximity to the surface. This is why, when you first take off in the wintertime, you often climb into a slightly warmer outside air temperature zone. This effect is even more pronounced after clear nights, when terrestrial radiation is at its maximum. You check the Inflight Aviation Weather Advisories . . .
Notice the vertical limits of that AIRMET, however, before you let yourself get too worried. This is actually encouraging -- it strongly suggests a relatively high freezing level. We like high freezing levels. This graphic is particularly alarming: not only does it show the potential for moderate to heavy ice in our area, it even warns of the possibility of SLD (supercooled large droplets). Despite the fact that there is no SIGMET for severe ice published, SLD should always be considered a very serious threat. This is where an inexperienced (or excessively nervous) pilot might completely freak out. "Heavy icing conditions," he exclaims in irrational terror, looking at the chart above. "I can't go! It's too dangerous! I have to cancel the flight! Aaaiiiggghhh!" Then he would run and hide, curled up shivering in a fetal position inside the station box. Well, maybe not -- but he might announce to Dispatch that he can't go because he doesn't think it's safe or legal. But you're much smarter than that. You are going to dig deeper to get the whole story. You are going to pull up all the raw data to develop a fuller, more complete mental picture of the overall weather situation and employ your extensive, detailed knowledge of meteorology -- along with your professional judgment and aeronautical experience -- to make a wise, prudent, sensible decision based on the true facts and practical circumstances. What you're looking for right now is further confirmation of your theory that due to a low-level inversion the real freezing level is actually significantly higher than 1,000 feet along a line between ORL and GNV. The temperatures at 6,000 feet for Melbourne (MLB) and Miami (MIA) are above freezing -- an excellent sign! -- and looking in the direction you're going, north, you see that in both Tallahassee (TLH) and Jacksonville (JAX) the forecasters are calling for two degrees below freezing at 6,000. So, still assuming a standard lapse rate, an actual freezling level at or above the range of 4,000-5,000 feet sounds quite reasonable between Orlando and Gainesville . . . for the moment. But you're not done yet. SRN FL PEN. 04Z HI PRES SLOLY BLDG OVR REGION. MTNS...SCT040-050. OCNL SCT CI. OTLK...VFR. CSTL PLAINS...BKN-OVC CI. BECMG 1617 SCT CI. OTLK...VFR. MTNS...BKN CI. BECMG 1719 SCT040-050. OTLK...VFR. PIEDMONT...BKN CI. BECMG 1719 SCT CI. OTLK...VFR. CSTL PLAINS...BKN CI. BECMG 1719 SCT CI. OTLK...VFR. NRN...SCT-BKN CI. 15Z SCT CI. OTLK...VFR. SWRN...BKN CI. 15Z SCT-BKN CI. OTLK...VFR. SERN...BKN130. TOPS FL250. 15Z SCT-BKN CI. 17Z SCT CI. PNHDL...BKN150. TOPS FL250. 15Z SCT-BKN CI. OTLK...VFR. NRN PEN...BKN120. TOPS FL250. 12Z BKN050 LYRD FL250. ISOL -RA. BECMG 1718 SCT CI. OTLK...VFR. BKN070 LYRD FL250. ISOL -RA. 18Z SCT035 BKN130. TOPS FL250. 21Z SCT040 SCT CI. OTLK...VFR. FL250. ISOL -RA. 20Z SCT025 BKN080. TOPS FL250. OTLK...VFR. 1215 OVC015. TOPS FL250. ISOL TSRA. CB TOPS FL400. WND G25KT. OTLK...MVFR CIG TSRA WND BR 23Z VFR TSRA WND. 1215 SCT015 BKN CI. WND N G25KT. 18Z SCT030 SCT CI. BKN-OVC100. TOPS FL240. WND NE G25KT. 21Z SCT020 BKN-OVC150. TOPS FL250. WND NW G25KT. OTLK...VFR. Notice that all over Florida, the rain is supposed to be tapering off and the clouds are supposed to be breaking up, leaving clear skies north of Sarasota and a very high broken or overcast ceiling down south. The outlook is VFR across the board. The plus-two reported surface temp at Gainesville -- the same as Orlando -- continues to suggest a low freezing level. More importantly, however, notice that the sky is unobscured and there is no precipitation. Therefore, there are no actual icing conditions. It's just clear, cold air. An airplane surface-structure temperature at or below zero degrees Celsius. VISIBLE moisture -- i.e., liquid water droplets such as clouds or rain, not just water vapor. The ceiling (defined, again, as the lowest broken or overcast layer) is never expected to fall below 5,000 feet. It's expected to rise to 10,000 feet and then 25,000 feet before becoming completely clear after 2300 Z (1800 Eastern or 6 P.M.) Even with a freezing level all the way down at the surface, there would be no threat of ice. This is great news. Will conditions be improving or deteriorating as you proceed northwestbound? IMPROVING -- dramatically, in fact. Will conditions be improving or deteriorating at all locations from your point of departure to your point of intended arrival as the day progresses? IMPROVING. Do you have reliable outs should you encounter ice? YES. What is your escape plan for that situation? DESCEND -- due to extremely low minimum enroute altitudes (MEAs) along your planned course, it would be very easy to get below any icing conditions you might encounter. 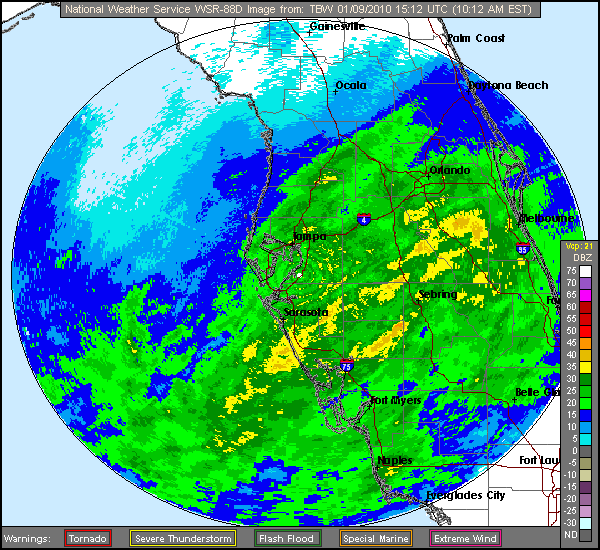 Looking at the radar picture, you can see that you will fly right out of all the precip almost immediately upon leaving the Orlando area and the Area Forecast -- along with the METAR and the TAF at Gainesville -- call for no clouds below the 5,000-foot range as you continue northwestbound. Are actual icing conditions expected or reported along your route and at your altitude? NO. The AIRMET refers to conditions above the freezing level -- between 10,000 and 27,000 feet. Not a problem for you! Do you need an ice-approved airplane to safely and legally make this flight? NO. Of course you could still choose to take a booted or TKS-equipped airplane if one happened to be available -- with Dispatch approval! -- but it is not legally required. A reasonable interpretation of the official weather indicates that it is possible to conduct this IFR flight without encountering actual in-flight icing conditions. Click HERE to return to the "Flying" index page.